The key elements to a healthy crop of potatoes are good hygiene and crop rotation. At the end of the growing season remove all traces of your potato plants from the top and below soil even if they have no pests or diseases. Potatoes left in the ground will eventually rot causing pest and disease. If potatoes are grown on the same land season after season this will also encourage pest and disease. Rotate the growing of potatoes on a three, or four yearly cycle. Always buy seed potatoes from certified suppliers. Probably the most common affliction of potatoes, even commercial farmers are affected by this disease. Easy to identify by the black blotches which appear on the leaves first. These then appear on the stems and the plants quickly begin to collapse. For more information on Potato Blight check out our comprehensive article on how to identify and treat potato blight. 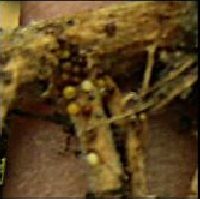 Common scab is an infection of potatoes by the bacteria Streptomyces scabies. It is not restricted to potatoes it affects other vegetables which form under the soil such as beetroot and radishes. The signs of infection are not visible above ground, it's only seen on the potato tuber itself when you harvest. The potato will will have raised, rough brown bumps on the skin, some cases of infection are worse than others. Infected potatoes are still edible and the quality and taste of the flesh is exactly the same as normal. Simply peel the potato as normal and you will remove almost all of the raised bumps leaving you with a perfect potato. 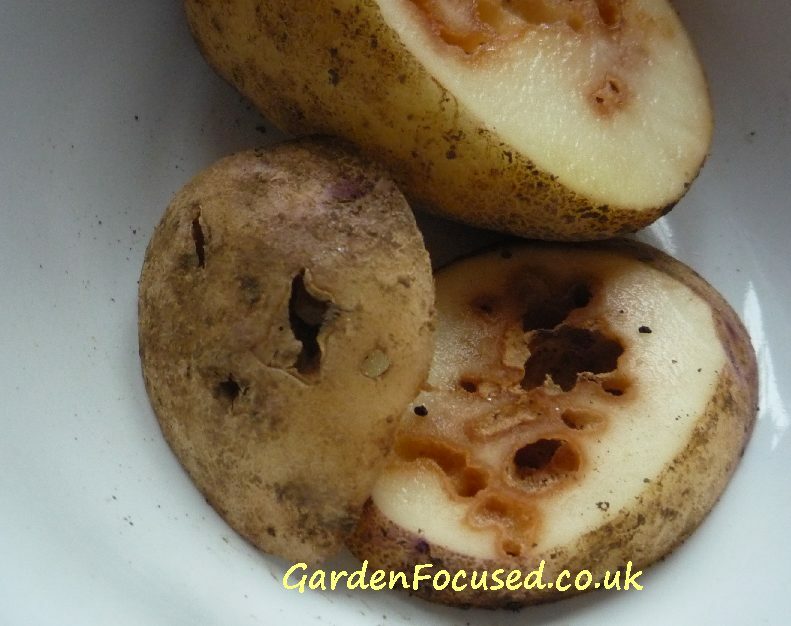 Common scab occurs mainly where water is scarce when the potatoes are developing. This is the key to avoiding the problem - aim to keep developing tubers in a moist but well drained soil. Lots of well rotted organic matter (the stuff on your compost heap) dug into the soil at planting time is the first line of defence. Watering the soil well when conditions are dry is also a good idea. There are no chemical solutions to scab so if it's common in your area stick to potato varieties which have a good level of resistance to scab such as Golden Wonder, Arran Pilot and King Edward. Common Scab is made far worse if the soil is alkaline so definitely do not add lime to the soil for at least a year before planting potatoes in it. It's astonishing how little information there is about effectively combating slug damage to potato tubers. The slugs burrow into the tubers when they are growing and leave tunnels in them with the surrounding flesh being turned brown. Affected potatoes are almost totally inedible. See the picture below. Choose varieties resistant to slug attack such as Charlotte, Estima, Golden Wonder, Kestrel, Romano, Sante and Wilja. If the problem is widespread grow early varieties which are not in the ground long enough for slugs to be a problem. Do not manure the ground before planting which encourages slugs, use blood, fish and bone as a fertiliser instead. Lift potatoes as soon as possible, slug damage normally starts at the beginning of August. The one exception which may work is an old gardener's trick. Place one slug pellet below each potato set when they are planted. I have no conclusive evidence if this works or not but from the experience of fellow gardeners it does seem to have a significant effect. Slugs and snails will also eat potato leaves leaving the edges ragged and often holes in them. They tend to affect the lower leaves more than the the upper leaves. We find that they rarely cause enough damage to do anything about them. Slug pellets or environmentally friendly solutions can be found on the internet. The first signs of Potato Blackleg are yellowing of the leaves which also curl upwards and inwards. Look at the potato plants stem and if it is black or brown at soil level (spreading upwards as the disease progresses) then you know your plants have Potato Blackleg. Click here for our detailed article on how to identify Potato Blackleg and what can be done to prevent and treat it. This pest is often referred to by different names, often Potato Cyst Nematode. It has two different Latin name as well just to complicate matters. The official names are Globodera rostochiensis (golden nematode) and Globodera pallida (white nematode), but they are sometimes referred to by their old Latin names Heterodera rostochiensis and Heterodera pallida. Colour aside, they are one and the same potato eelworm. 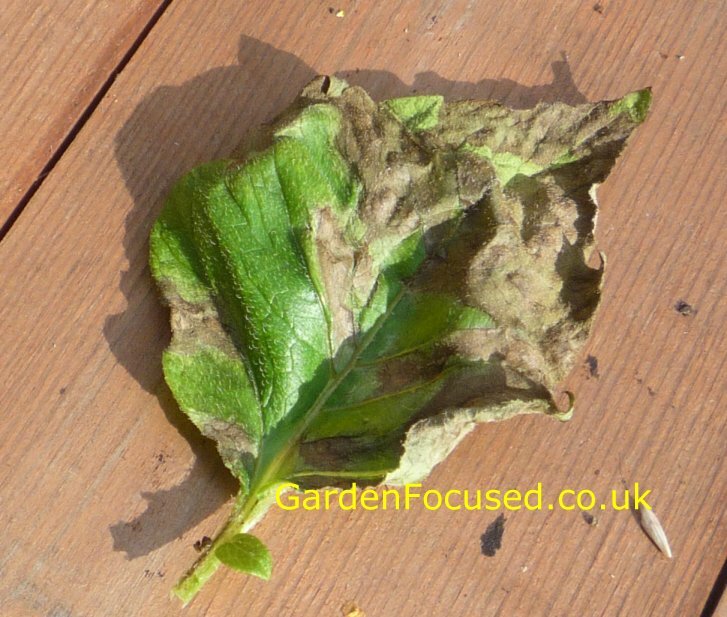 They are difficult to diagnose but the key symptoms are yellowing of the leaves, general poor growth and small tubers. The only way to confirm this very common pest is to dig up affected potatoes and examine the roots with a magnifying glass or microscope. Potato eelworm do NOT eat into potato tubers, they feed on the roots alone. If you have holes in your potatoes suspect slug or cutworm or wireworm (see below) damage. Click here for our detailed article on potato eelworm. The damage will only be seen when you dig your potatoes up at harvest time. Each affected tuber will have several small holes in them. The holes will have a black edge with a slightly larger brown ring around the edge. You may or may not find signs of the eelworms themselves still present. Click here for our detailed page on how to identify wireworm and how to successfully get rid of them.